A jacking contractor recently installed two giant drainage pipes beneath a busy railroad line as part of a flood control project in Windsor, Conn.
Caron, Inc., pipe jacking and boring specialist from Berlin, Conn., jacked two 96-inch (I.D.) pipes beneath two sets of Amtrak/Conrail tracks under an improvement program for Decker Brook in southern Windsor. The Berlin firm had a $403,060 contract to Jack two heavily reinforced concrete pipes a distance of 70 feet beneath the tracks. 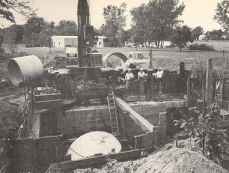 Other contractors on related Decker Brook work were Della Construction Co. of Enfield, who built concrete channels, Baier Construction Co. of Hartford, who constructed box culverts, and JMJ Concrete Co. of Glastonbury, who built the concrete endwalls. The two large-diameter pipes replaced a 66-inch drain beneath the tracks that was incapable of handling large flows from the brook, creating a bottleneck behind the railroad embankment during heavy storms. Jacking was a delicate operation because of the railroad traffic and relative shallowness of the pipe. Only ten feet separated the tracks and the top of the pipe, and any significant settlement of the earth due to jacking could have caused a derailment and possibly a disaster, Because of this, Amtrak officials carefully scrutinized the contractor's plans and monitored the operation itself. Caron's project manager Bill Lane submitted the engineering drawings showing pit design and jacking and steering shield details to Amtrak Senior Staff Engineer A.C. Erickson in Philadelphia for his perusal before construction began. The structural analysis of the pit and reaction block was provided by Caron's consultant, Ed Chapin, P.E. Before the Jacking began, John Mosdale of the Windsor Department of Public Works and Ronald Boucher of Caron coordinated the Railroad forces and contractors to ensure a smooth running operation. Once the project was approved by the Railroad and a schedule prepared, Caron escavated the jacking pit and constructed a cofferdam of AP-3 sheeting measuring 36 feet by 24 feet in plan. To absorb the tremendous force of the two 300-ton jacks which were to push the big pipe through. Caron built a 16-foot by 4-foot by 12-foot reinforced concrete reaction block on the back wall of the pit. On the receiving side of' the tracks, Caron installed AP-3 sheeting and 12WF53 wales to support the railroad embankment. For safety reasons, Amtrak crews fabricated a temporary track support structure over the centerline of the pipe right-of-way. Acting as a simple span, the structure would carry the weight of a passing train should a void occur during jacking. One structure was used. As the first pipe was successfully jacked through, the track support was moved over to the centerline of the second pipe. The extra-heavy pipe for the project was supplied by Atlantic Pipe Co. of Plainville, Conn. Each eight-foot-long section of the pipe has a wall thickness of 10 1/2 inches and weighs 16 tons. To handle such large pipe, Caron used a 75-ton P&H hydraulic crane. Just before jacking commenced, a level was set up to monitor the rail elevations, as a precaution against track settlement during construction. Once the operation got underway, Caron's men found ideal subsurface conditions. A combination of' sand and clay greeted the tunnelers who excavated the material as the pipe was pushed through the soil. The pipe moved easily, and the necessary handshoveling of soil into the spoils cart was a relatively dry, stand-up operation for the men. They averaged about one lineal foot per hour -a speedy pace for this type of' work. 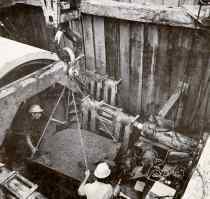 A winch cable towed the spoils cart from the tunnel face to the Jacking pit, where the P&H hoisted the cart to the surface and emptied it. The pipes used for the Jacking each contained a number of small holes spaced every three feet on center circumferentially and every four feet longitudinally. Once the pipes are in place, concrete is grouted through the holes, the idea being that the concrete will fill any voids surrounding the pipe. In this case, however, according to Caron project manager Lane, it was impossible to inject the grout, indicating that the soil was so consistent and tight that no voids formed. In addition to the personnel mentioned, others involved in this project included: for Amtrak, Mike Massad, who was responsible for the safe operation of the trains during the Jacking-, and for the town of Windsor, DPW Director Ted Edson, Construction Project Manager Jim Ferrenti, Town Engineer Ernie Phillips, and Survey Chief Ozzie Blint. Most of the photos used in this article were taken for Caron, Inc. by Zaremba of Bloomfield, Conn.